Here's a sample test app, with step-by-step explanations, that serve as a roadmap to building your own table-based JavaFX applications. 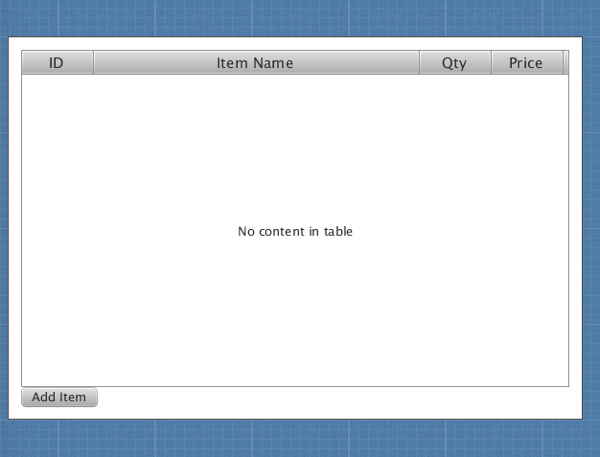 At first glance, using the JavaFX 2 TableView control may seem confusing. But after you have the first "Aha!" moment with it, you'll see just how easy it is to use. Thanks to JavaFX binding and the new JavaFX Scene Builder, it's all cake. Here's a sample test app, with step-by-step explanations, that serve as a roadmap to building your own table-based JavaFX applications. If you have the latest Java SE 1.7 installed (Update 4), then you have JavaFX by default — it's bundled with it. Otherwise, you can download and install it separately here. Remember, you can develop JavaFX 2.0 applications with either Java SE 1.6 or 1.7. After JavaFX is installed, create a new JavaFX project. This is very easy with the latest NetBeans, but you can use any IDE you'd like. For now, I'll assume you're using NetBeans. Save your Scene Builder work, saving the resulting FXML file in the same directory as your application's source code. Next, in the Document section on the right side of the Scene Builder window, make sure you choose your project's main class as the controller. It's important that these steps be performed in that order. Since InvoiceEntry isn't defined yet, this code won't compile. Create this class now as defined below, and then fix the imports so the code will compile (in NetBeans, right-click on the code and choose "Fix Imports" from the menu). Note: It's very important that this class contains getter methods for the data items that map to columns in the table. This is how JavaFX performs its magic and reduces the code you need to write. It calls the getters automatically, as long as they conform to the normal JavaBeans naming patterns for class data.